Dubai Shopping Festival is one of the busiest times of the year that retailers capitalize on by introducing offers and promotions to entice consumers to purchase their products. Impact BBDO, devised the 'Visa Deals' campaign that took place during the Dubai Shopping Festival from 1st January to 1st February 2016. The purpose was to increase Visa's brand footprint in among financial institutions, retailers and consumers. They needed a way to communicate with the participants of the 'Visa Deals' campaign to ensure that Visa Middle East's campaign objectives would be met. With a large target audience, sending out generic content to all participants would not help Visa personify its brand with each participant in the 'Visa Deals' campaign. Hence, Reson8 was customized in order to personalize every email and SMS that was sent out to the participants of the 'Visa Deal' campaign. This was accomplished by means of placing unique shortened URLs in the text messages for each participant. 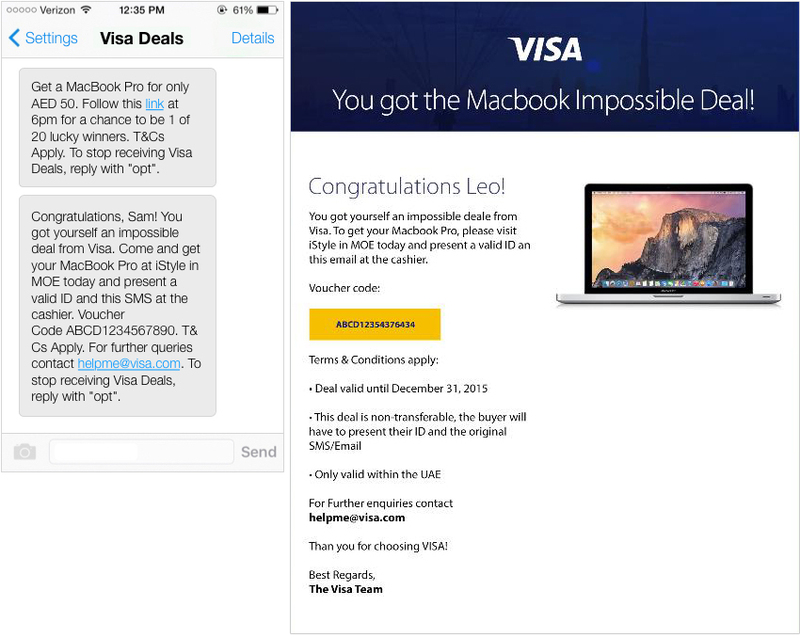 This would uniquely address the deal information to each participant in the 'Visa Deal' campaign as shown below. Visa Middle East chose UCS' flagship product ? Reson8 to send notifications via Email and SMS to registered participants of the 'Visa Deals' campaign. Using Reson8, UCS dynamically communicated the content for daily 'Visa Deals' to the participants via Email and SMS. 1-Jan-15 MMI TRAVEL VOUCHERS Click http://bit.ly/VisaDSF2016 today at 2PM (+4 GMT) to be eligible to buy MMI travel vouchers for AED2,000 (RP: AED10,000). T&C apply. OPTOUT 1234. 2-Jan-15 TAG HEUER FORMULA 1 LADIES' Click http://bit.ly/VisaDSF2016 2PM (+4 GMT) today to be eligible to buy 1 of 6 Tag Heuer ladies' watches for AED2,000 (RP: AED9,950). T&C apply. OPTOUT 1234. 3-Jan-15 VOX GOLD Click http://bit.ly/VisaDSF2016 today at 2PM (+4 GMT) to be eligible to buy 1 of 125 pairs of VOX GOLD tickets for AED40 (RP: AED180). T&C apply. OPTOUT 1234. Reson8, as powerful digital communications engine, was able to trigger scheduled personalized SMS and emails to registered participants on time allowing them just-in-time access to the campaign and building excitement during participation. Using Reson8, Visa Middle East was able to broadcast information about their daily 'Visa Deals' to a massive number of people which resulted in 1,647,253 SMS and 1,765,000 emails being sent. Out of which Reson8 facilitated 40,000 SMS and emails on a daily basis. The campaign allowed Visa Middle East to greatly increase their footprint in the region. Visa Inc. is an American multinational financial services corporation headquartered in Foster City, California, United States. It facilitates electronic funds transfers throughout the world, most commonly through Visa-branded credit cards and debit cards. Visa does not issue cards, extend credit or set rates and fees for consumers; rather, Visa provides financial institutions with Visa-branded payment products that they then use to offer credit, debit, prepaid and cash-access programs to their customers. Visa has operations across India, Australia, Oceania, Asia-Pacific, North America, Central and South America, the Caribbean, Western Europe, Central and Eastern Europe, Africa and Middle East. Unique Computer Systems is an application development and a system integration company specializing in mobile and web technologies. Unique Computer Systems specializes in three primary segments: Mobile and Web Application Development, Systems Integration, Products and Services. Unique Computer Systems, a leading provider of specialized IT and engineering solutions worldwide. UCS is headquartered in the United Arab Emirates. We offer knowledge and experience that is truly unique in the technology market. Our Company is known for its outstanding customer service and our financial stability. Our management team is committed to the philosophy that customer satisfaction is the key to growing and maintaining our business.